World Leader in Used Die Casting Machinery! Click here to request a free, no obligation quote. 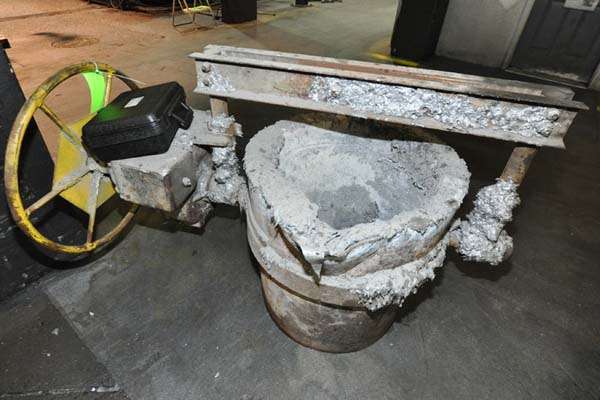 Used Modern Equipment 650 Pound Capacity Hand-Wheel Tilting Transfer Ladle for Molten Aluminum Alloys. Inventory item: DCM-4013. We offer same day shipping on many of our products with next day delivery available within the United States in most cases. We can supply both domestic and international export packing using ISPM-15 certified materials. We can supply contractor services for dismantling, rigging, packing and transportation. Within North America we can ship single pieces weighing up to 182,000 pounds/82,727 kg. We have shipped many die casting machines internationally up to 4,000 tons. : We offer Expedited International shipping available to the following Countries: India, Germany, France, Spain, Portugal, Switzerland, Italy, England, Sweden, Netherlands, Poland, Turkey, Ukraine, UK, Great Britain, Russia, Australia, Japan, Korea, Thailand, China, Singapore, Canada, USA, Mexico, Brazil, Argentina, Columbia, Venezuela and Peru. PURCHASER'S (Buyer's) RESPONSIBILITY AND INDEMNITY: Used machines, equipment or any part thereof, may not incorporate approved activating mechanisms, operator safety devices or safety guards as required by OSHA or otherwise. It shall be a Purchaser's (Buyer's) responsibility to ensure that any and all merchandise or equipment purchased from Die Cast Machinery, LLC or its affiliates is installed and operated in a proper and safe manner. Purchaser (Buyer) also acknowledges that it may have to install or change guards, safeties, warnings or other components to ensure that the merchandise or machines purchased will conform to all laws, codes, regulations, ordinances, statutes, insurance requirements and industry standards. Purchaser agrees to defend, indemnify and hold harmless Die Cast Machinery, LLC from and against all suits, claims, costs, damages and expenses, including, but not limited to, reasonable attorneys' fees, arising out of, or in connection with, the transportation, purchase, ownership, or use of the merchandise or equipment sold hereunder. Information has been obtained from sources deemed reliable, buyers should avail themselves of the opportunity to inspect the items before purchase. You have item(s) in your cart; you can continue adding items by clicking on any of the Related Items buttons at the bottom of the page. If you are finished you can request your quotations by clicking on the Request Quotation Now button. Your request for more information has been added to your RFQ Cart which contains the item(s) listed below. You may continue browsing our inventory to add additional items, or submit your request now by completing the fields below and clicking "Submit". Your request is being processed! Would you like to receive free automatic email alerts when new inventory matching this machine becomes available? Your email address is already associated with an account. Click here to login and add these alerts to your existing account. Thank you for visiting our website and for your interest in our machinery. Our professional staff will respond with quotations as soon as possible. If you have any other questions please contact us by clicking here. Please wait while we process your items. We buy and sell all types of equipment used in the die casting and foundry industries including: die casting machines, rotor casting machines, low pressure casting machines, permanent mold casting machines, trim presses, melting & holding furnaces, automation, x-ray machines, spectrometers, shot blast, vibratory finishing, inspection, tooling and CNC machining equipment.